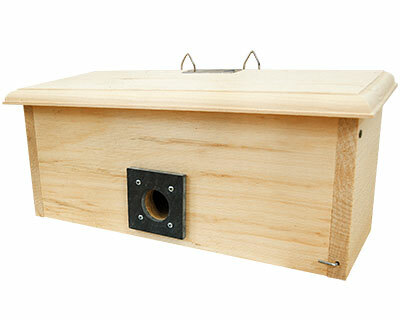 Offer songbirds a warm place to rest in the winter using the Coveside Horizontal Winter Roost. This box features an opening hole at the bottom, which helps keep the interior warm. As warm air rises, it is trapped inside the box rather than exiting through the entrance hole. An extended perch inside the box offers room for several birds to roost. The front of the box lifts upward for easy cleaning and observation, and the "L" shaped metal hook keeps it securely closed. The entrance hole is protected by a slate guard to discourage squirrels. The slanted roof allows water to run off of it, rather than into the box. Use the included metal hangers to mount this roost on a building or post. Crafted from solid eastern white pine, this box will age to a beautiful gray color, and will never need to be painted or stained. Help birds weather the winter using this Horizontal Winter Roost. Made in the USA from solid eastern white pine.